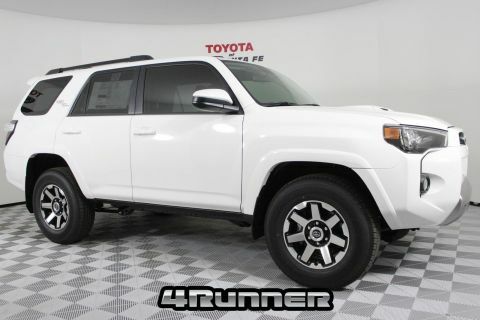 Automatic New 2019 Toyota 4Runner TRD Off Road stock # K5685069 has Super White exterior with a Gray and Fabric upholstery. This New Mexico Sport Utility Vehicle has 4 doors and carries 5 passengers. Some of the options include: 3.727 Axle Ratio, Fabric Seat Trim, Radio: Entune Audio Plus, Radio: Entune Premium Audio with Navigation, Kinetic Dynamic Suspension System (KDSS), Off Road Package, Door Edge Guards, Roof Rack Cross Bars, Predator Tube Step, All-Weather Floor Liners/Cargo Tray Package, Black Roof Rails, AM/FM radio: SiriusXM, Exterior Parking Camera Rear, Emergency communication system: Safety Connect, Tracker system: Entune Safety Connect, 4-Wheel Disc Brakes, Air Conditioning, Electronic Stability Control, Front Bucket Seats, Front Center Armrest, Leather Shift Knob, Spoiler, Tachometer, ABS brakes, Alloy wheels, Anti-whiplash front head restraints, Brake assist, Bumpers: body-color, CD player, Driver door bin, Driver vanity mirror, Dual front impact airbags, Dual front side impact airbags, Front anti-roll bar, Front fog lights, Front reading lights, Front wheel independent suspension, Heated door mirrors, Illuminated entry, Knee airbag, Low tire pressure warning, Occupant sensing airbag, Outside temperature display, Overhead airbag, Overhead console, Panic alarm, Passenger door bin, Passenger vanity mirror, Power door mirrors, Power driver seat, Power steering, Power windows, Rear anti-roll bar, Rear seat center armrest, Rear window defroster, Rear window wiper, Remote keyless entry, Roof rack: rails only, Security system, Speed control, Speed-sensing steering, Split folding rear seat, Steering wheel mounted audio controls, Telescoping steering wheel, Tilt steering wheel, Traction control, Trip computer, Variably intermittent wipers, 8 Speakers, Compass, PREDATOR TUBE STEP, OFF ROAD PACKAGE, RADIO: ENTUNE PREMIUM AUDIO WITH NAVIGATION -inc: Entune Multimedia bundle (6.1 high resolution touch-screen w/split screen display AM/FM CD player w/MP3/WMA playback capability 8 speakers auxiliary audio jack USB 2.0 port w/iPod connectivity and control advanced voice recognition hands-free phone capability phone book access and music streaming via Bluetooth wireless technology) Siri Eyes Free Entune AppSuite HD Radio HD Radio predictive traffic and Doppler weather overlay AM/FM cache radio SiriusXM satellite radio w/3-month complimentary all access trial Gracenote album cover art and integrated backup camera display w/projected path Entune App Suite includes Destination Search iHeartRadio MovieTickets.com OpenTable Pandora Facebook Places Yelp and Slacker Radio; real-time info including traffic weather fuel prices sports and stocks, KINETIC DYNAMIC SUSPENSION SYSTEM (KDSS), ALL-WEATHER FLOOR LINERS/CARGO TRAY PACKAGE, KEEP IT WILD SAVINGS, DOOR EDGE GUARDS, ROOF RACK CROSS BARS, ABS, Tow Hitch, Aluminum Wheels, Tires - Front On/Off Road, 4-Wheel Disc Brakes, Four Wheel Drive, Conventional Spare Tire, Brake Assist, Tires - Rear On/Off Road, Locking/Limited Slip Differential, Power Steering, Engine Immobilizer, Intermittent Wipers, Cruise Control, Steering Wheel Audio Controls, Security System, Power Driver Seat, Trip Computer, Adjustable Steering Wheel, Child Safety Locks, AM/FM Stereo, Auxiliary Audio Input, Tow Hooks, Knee Air Bag, Front Side Air Bag, Power Mirror(s), Rear Head Air Bag, Power Windows, Variable Speed Intermittent Wipers, Passenger Vanity Mirror, Back-Up Camera, Leather Steering Wheel, Power Door Locks, CD Player, Rear Spoiler, Floor Mats, Stability Control, Pass-Through Rear Seat, A/C, Driver Air Bag, Privacy Glass, Daytime Running Lights, Rear Bench Seat, Driver Illuminated Vanity Mirror, Bucket Seats, Cloth Seats, Driver Adjustable Lumbar, Heated Mirrors, Tire Pressure Monitor, Keyless Entry, Satellite Radio, Passenger Air Bag Sensor, Telematics, Front Head Air Bag, HD Radio, Driver Vanity Mirror, MP3 Player, Passenger Illuminated Visor Mirror, Bluetooth Connection, Traction Control, Fog Lamps, Rear Defrost, Automatic Headlights. 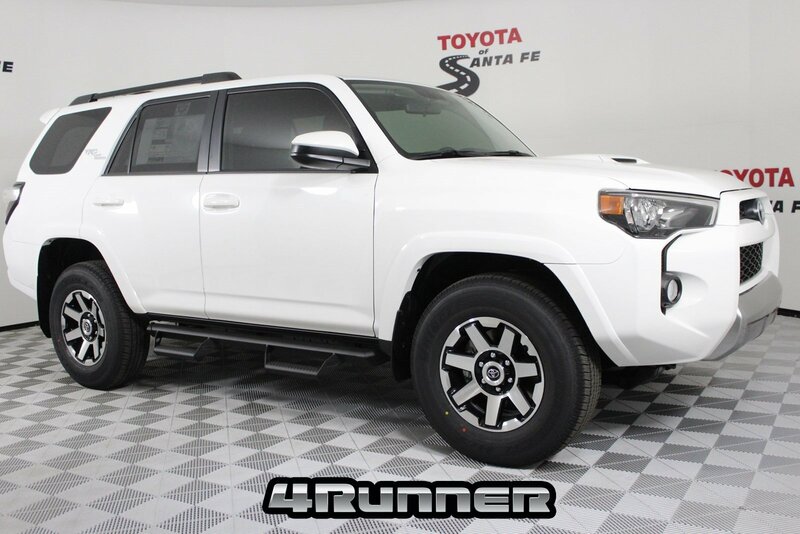 Ask for stock # K5685069, the Santa Fe New Mexico new 2019 Toyota 4Runner TRD Off Road.Call right now and schedule a test drive. Visit us online at www.toyotaofsantafe.com or in person at 1601 Saint Michaels Drive, Santa Fe, NM 87505. We serve all of New Mexico. Price includes all costs to be paid by consumer except for sales tax, registration, title, and $369 dealer transfer service fee. Price is valid for date of sale only. Internet price includes all available offers, incentives, and factory rebates assigned to the dealer.